The year is 1912 and Britain is gripped by fear of war with Germany. Intelligent and headstrong, young Leonora Malham Brown feels stifled by the restraints imposed on her by her respectable middle-class upbringing. But a chance encounter with the feisty Victoria Langford is set to broaden her horizons irrevocably. Victoria introduces Leo to the FANY, the First Aid Nursing Yeomanry, where the two girls learn First Aid, stretcher drill, veterinary work and signalling. When trouble flares up in the Balkans, Victoria and Leo decide to put their skills to practical use and head to Bulgaria to offer their assistance on the battlefield. And so they set off on the adventure of a lifetime, neither of them fully prepared for the grim realities of war. But as well as danger, fear and excitement, Leo will find unexpected – and passionate – romance. ‘Which is why that is where we are most needed,’ Leonora retorted. 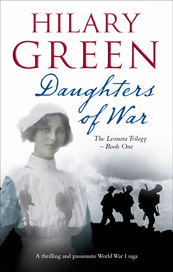 WHAT READERS SAID ABOUT ‘DAUGHTERS OF WAR’. Hurrah – how exciting we have another trilogy to keep us on the edge of our seats waiting to see what happens to all the people who you have created for us to get to know.